Inside the Henry Jones Art Museum, Hobart. With enough old-world charm to impress the staunchest of contemporary fans, the Islington takes the historic and makes it cool and convivial. A century-old structure mingles with a modern conservatory, restaurant and guest wing; each room adorned with art, antiques and plush furnishings. In any of the 11 suites at The Islington, you can sink into a custom-made ultra-comfy king-sized bed each night. Or soak in a free-standing bath tub in your private marble bathroom, lathering up in luscious Aesop amenities. Outside is pretty special too – large manicured gardens, views of Mount Wellington and pond-side places to enjoy a good book. Then there are little extras like the complimentary mini-bar, iPads in every room and home-baked organic treats at your disposal. Also make time to sample from the hotel’s own wine cellar, featuring Tassie’s best drops. Not to mention the restaurant – renowned for delicious seasonal menus using Tasmanian produce. And for the full-cooked breakfasts each morning (complimentary, mind you), there is no menu – guests are encouraged to order anything they desire. Within reason of course, the kitchen can’t whip up a Brad Pitt. But given the surroundings, you won’t be disappointed. This truly is a private, indulgent getaway to share with your someone special. Old meets new in this jam-factory-come-art-hotel, which is inspired by the Apple Isle’s early European settlement. Located on Hobart’s waterfront, in a row of historic warehouses, the Henry Jones is in prime position for exploring the city’s central attractions. However it is the interior that draws in art-lovers and history-buffs alike. Each of the 50 guest rooms come with a modern glass bathroom and plush bedding, alongside original sandstone walls and exotic silks – a nod to the thriving trade once between Van Diemen’s Land and the East. Suite at the Henry Jones art hotel. At the forefront of the hotel’s design is an ever-changing selection of 300-plus artworks. From established artists to graduates of the Tasmanian School of Art, works vary between paintings and prints to sculpture and photomedia, with most available for purchase. In fact the art offering here is so big that you can book in for an in-house art tour, check out the hotel’s design gallery, or their online art catalogue. However the Henry Jones isn’t just a feast for the eyes, Henry’s Restaurant will keep your tastebuds happy, as will Jam Packed Café, while the IXL Long Bar is perfect for a pre-or-post dinner tipple. Which we’d recommend you indulge in. The Richardson claims to have been inspired by the wide open spaces of Western Australia. Rooms sprawl across an average 55 square metres, while penthouse suites go up to 170. And adding to the sense of place are original artworks by Australian artists, celebrating the state’s landscape. But even with the roominess of the hotel, there is still a sense of intimacy. Every guest receives a personal welcome card from the general manager, along with a little gift. Extras like Wifi, bottled water, daily newspapers and chocolates at turn-down are all complimentary to make your hotel room feel homely. If you’re travelling with youngsters, children are treated to cookies with their names written in chocolate on arrival, while teenagers are given popcorn and a list of in-room movies. If only these stone walls could talk. Over 125 years, this historic hub has been renovated and rebuilt into a hospital, a quarry, and residential housing, before its most dramatic metamorphosis yet: the Harbour Rocks Hotel. 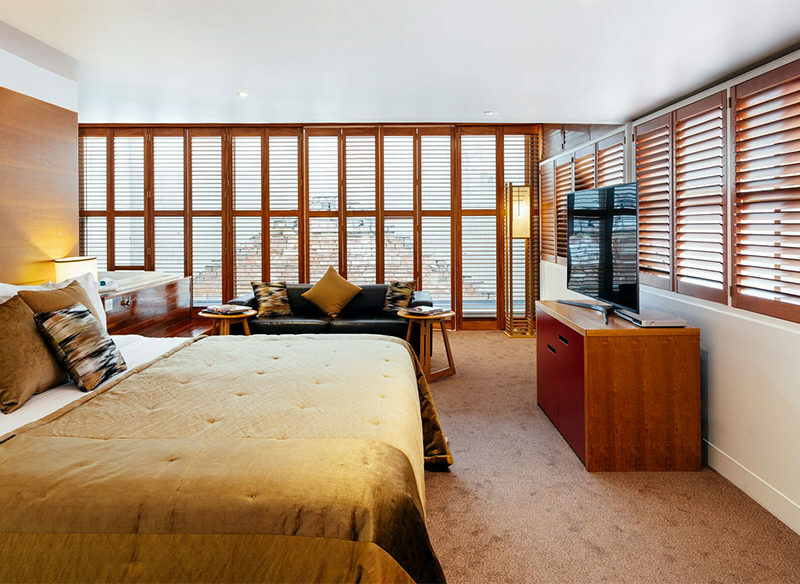 A combination of rustic raw edges and sleek contemporary design makes this 59-room hotel a stylish and intimate city escape in The Rocks. From the moment you arrive and check in at the bar, a complimentary drink eases you into holiday mode. And although check-in begins at 2pm, guests arriving early or departing late can still make use of the hotel’s shower facilities – how thoughtful! Also sharing the lobby area is a wine bar and library, with over 2000 books that guests may borrow. But the real must-do is the hotel’s Scarlett Restaurant – named after a lady of the night who ran a brothel next door in the late 1800s. Great food aside, the restaurant’s sandstone walls are worth a visit, revealing chip marks by convict stonecutters. And we haven’t even got to your room yet – think earthy tones, requisite mod cons, charcoal-coloured walls, sleek furnishings and a 24-hour concierge at your disposal to take care of any bookings. Nestled just near the Harbour Bridge, Establishment Hotel is all about location, location – if you can find it, that is. This sleek, chic hideaway is such a Sydney secret that locals don’t often know it’s there (and those in-the-know aren’t in any rush to share). Hidden down a nondescript laneway, with two oversized pot plants as the only giveaway, a lavish little world greets you once you step inside, with 31 guest rooms decked out in two different colour schemes – one bright and bold, the other neutral and subtle. Along with uber-attentive service, expect all the trimmings here: waterfall shower heads, free Wifi and a neat little gym – or our favourites, the Bvlgari amenities and in-room iPad 2. Set inside an old, refurbished bank, the building offers all kinds of sensory delights, all brought to you by hospitality mogul Justin Hemmes: Mr. Wong for decadent Chinese, Hemmesphere Bar for adventurous cocktails, Palmer & Co for a late-night whiskey, and est. – the three-hatted, multi-multi-award-winning Sydney institution, just the spot for a fabulous meal. From the outside, Brisbane’s Spicers Balfour looks like another refurbed Queenslander home, lining the streets of hip, inner-city suburb New Farm. But inside are nine luxurious rooms, each with their own bold design that ties into the hotel’s eclectic, European-inspired décor. Great for anyone looking for a modern B&B experience, Spicers Balfour is all about first-name service and complimentary extras (and not a doily or floral bedspread in sight). Expect evening canapés, a nightly turn-down service with sweet treats, and best of all – full-cooked breakfasts. It’s the bold and the beautiful at Emporium Hotel, which is all about kicking back and indulging in life’s guilty pleasures. For some the experience begins with a bottle of French sparkling and chocolate-dipped strawberries delivered straight to your room on arrival. And if that’s not enough, each room boasts plush bedding, delicious Molton Brown bathing therapies and state-of-the-art entertainment technology. Although you won’t be staying in for long – not with the hotel’s luscious cocktail bar downstairs, hosting high teas by day then concocting serious cocktails by night. Emporium’s own Belle Époque French Patisserie is also a must, not to mention the retail therapy to be had throughout the rest of the complex. Yes, this is serious girls-getaway territory, but also makes for a decadent escape for couples. Then after a hard day of cocktails, sweet treats and in-room massages (they’re available too! ), a special evening turn-down service sprinkles your bed in rose petals and offers a pillow menu, from the classic ‘down feather’ to ‘pregnancy pillow’. And for the final touch, a complimentary water bottle is placed in each guest car on departure, to keep you hydrated on the drive home… that’s if you ever decide to leave. Boutique hotel meets art gallery at this heritage-listed gem, and it’s no wonder given the location – in between the National Gallery of Australia and National Museum of Australia. The Diamant’s close ties with these neighbouring landmarks means guests can sometimes arrange tickets to special events and previews. But if you’d rather stay in and enjoy the hotel’s own artistic offerings, there’s an eclectic mix of emerging and established artworks displayed throughout. In fact guests can marvel at original pieces in their room, as well as designer furniture and unique wall paper treatments on the ceiling. There are also regular performances by members of the Canberra Symphony Orchestra held in the lobby. And for ladies travelling solo, the Diamant offers a special Women’s Pack, complete with glossy mags, T2 Tea and a facial treatment. If that doesn’t get you in holiday mode, try the onsite hair salon, day spa or Bicicletta restaurant – dishing up authentic Italian food using local produce. Art, music and food; it’s a one-stop shop to Canberra’s cultural best. First-name service, cosy corners, and staff that go beyond the call of duty – this is what a boutique stay is all about. The Lyall is a place for serious R&R, where you might see ladies of leisure and high-powered businesspeople wandering around on their down time. Each guest room combines bespoke furnishings, signature beds with pillow menu and an impressive mini-bar stocked with local goodies – especially good when making use of the hotel’s DVD library. Then on each floor is a mini art gallery featuring original pieces, as well as a fireplace and lounges to cosy up on. But it’s the service that sets the Lyall apart – with staff that will happily mind your laptop, collect your car or pick up your shopping. The hotel concierge can also arrange just about anything, including behind-the-scenes tours of the Victorian Arts Centre, or a table at a restaurant with a waiting list. But if you’d rather stay in (we don’t blame you), The Lyall Spa is a must. Taking a holistic approach to wellness, there’s an extensive menu of therapeutic and beauty treatments including naturopathy. This truly is a hotel that cares for you inside out. Like guests, no two rooms are the same in this heritage-listed building in cosmopolitan St Kilda. Each room comes with a different layout, but all boast an impressive collection of art and designer furniture. Set amongst a palate of natural timbers, craypot lights and marble bathrooms, you can expect all the trimmings – mod con must-haves, mini-bar with champagne, luxe linen, waffle-weave bathrobes. The Prince is certainly one for the young, cool and cashed-up. And we haven’t even got to the complimentary extras, like the DVD library, Wifi, valet parking and breakfast at in-house restaurant Circa. Speaking of, Circa has been receiving rave reviews for its fusion menu, combining Australian and Asian influences. But do yourself a favour and make time for Aurora Spa Retreat. Combining seasonal oils, stones from the Kimberley, massage and meditation – you can’t go wrong. However the cherry on top this stylish stay is preferential treatment at other Melbourne Pub Group properties, such as the often-booked-out Newmarket Hotel. A princely stay indeed! Hotel Lindrum offers the warmth and thoughtfulness you’d imagine when visiting a loving aunt’s house…who just won the lottery. Set in a restored 1920s tea house, the Lindrum experience begins with a complimentary beverage at check-in – think mulled wine in winter or a light Turkish apple tisane in summer. This welcoming ambience continues in any of the guest rooms, decked out in polished timbers, thick woven carpet and soft lighting. Here you can lap up in-room massages or facials too. But the best place to unwind is snuggled up in front of a crackling fire in the sitting room. And if you forget to bring a book, there are iPads for loan or the Back Bar features a small library that guests may borrow from. If you can pull yourself away from this, there’s a full-sized billiards room next door, as well as Felt restaurant with delicious seasonal fare. And then there’s Walter – the hotel’s unofficial teddy bear mascot that selected guests can take home as a memento of their stay. Thanks, Aunty Lindrum.